Professor Yosuke Hirayama of Kobe University, probably Japan’s foremost scholar on the subject of housing and social policy, was the subject of a fairly long interview in the Asahi Shimbun recently, and though everything he said has been discussed at length in this blog, his explanation of what’s wrong with Japan’s official housing policy deserves to be summarized, especially in light of the current worldwide movement to close the income gap. For sure, Hirayama’s belief that government must shift its policy away from home ownership may raise the hackles of free market advocates and libertarians since it basically takes for granted the idea that housing is such a basic need for all members of society that the authorities need to be involved. What’s notable is that his ideas are based on classic, some might say prosaic economic principles; but in any case it was government that created the problem in the first place. In a nutshell, Hirayama says that Japan’s long-time housing policy, which is based on promoting home ownership, has hit a wall, and that the government should shift this policy to promoting rentals. He begins by citing the disaster in the Tohoku region, where home ownership is even higher than the national average and where a good portion of these homeowners are elderly people who live alone. They are already in debt, and to encourage them to build new houses is simply to push them further into debt. Instead, the government should promote the construction of more rental housing and offer subsidies to renters. 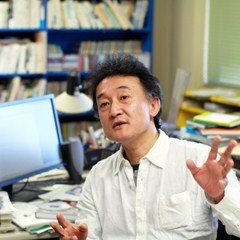 He mentions that he himself lived through the Great Hanshin Earthquake of 1995, and at the time was renting. Compared to homeowners, he survived the situation without as much emotional or financial trouble, because all he had to do was move. Of course, earthquakes are unpredictable, and by themselves can not be used to argue against home ownership (though he also points out that seismologists predict a better than even chance of a major earthquake hitting a large populated area in Kanto or Tokai in the next 30 years). The point is that renting has its advantages, a notion that has no traction in Japan. Hirayama calls home ownership in Japan “a religion,” which may sound like hyperbole given that, at 60 percent, the home ownership rate is below that of a great many other countries (though it is above the rates for France, Denmark, the Netherlands, and Germany). What Hirayama seems to means is that after the war, the Japanese government hit on home ownership as the main “engine of growth,” and thus instilled a kind of dogma. People were “induced” to buy homes, whereas the vast majority of Japanese before the war rented. The government set up a housing organ to provide financing for people who wanted to own their own homes through long-term, fixed low-interest loans. After the scare of the first oil crisis of the early 1970s, the government made this policy the central pillar of its growth plan, and strengthened it further thoughout the 1980s and 1990s either by increasing the budget for home ownership-related measures or increasing tax deductions for home loans. The idea, of course, is that home ownership is the most effective means of lifting all boats in the economy, and it is, as long as inflation is the norm. As prices rise so do wages and the value of assets. It was once common sense to believe that a home was a person’s most valuable possession. Hirayama claims this “home ownership society” is unique to Japan. That sounds a bit farfetched, but what he is probably talking about is the strict adherence to process, which is very important in Japan. It’s not just moving from rental to ownership, from small to big, from condo to single-family home. What it means is that after university you join a company for life, get married, have children, and then buy a home. This is common in many countries, but in Japan the process has been “standardized” through official policy. Japan’s tax and social security systems “privilege” the “standard household,” which consists of a breadwinner, a non-employed homemaker, and two or three children. For instance, the housing finance corporation did not accept applications from single people until well into the 1980s. The public housing system, whether federally subsidized or locally provided, was only open to families. As long as society stuck to the plan, everything went smoothly. Everything went into the crapper after the end of the bubble period of the 1980s, ushering in the long period of stagnation. Under the deflation that inevitably took hold, loans become more of a burden, because the value of property decreases (regardless of quality, which is even dodgier in Japan). Moreover, wages don’t rise in a stagnant economy, employment isn’t stable, additional debt becomes riskier and riskier. The whole “rationale” of home ownership is gone. In 1977, there were 2.6 applications for every unit of low-income public housing in Japan. In 2008, there were 8.6 applications. The economic conditions that made home ownership an effective engine for growth had mostly disappeared. The “life course” that supported the government’s policy, as Hirayama puts it, didn’t apply any more. Fewer university graduates were getting employed full-time, and thus they weren’t getting married and having families as soon as they had in the past, if at all. According to Hirayama, 30 percent of men and 23 percent of women who turn 50 in 2030 will have been single their whole lives. The portion of households consisting of one person will be 37 percent. These people cannot buy houses. But even those who bought houses in the past are already having problems. In 1990, the number of home owners who were more than 6 months behind on their mortgage payments was 3,340. In 2006, the number was 50,417. The total yen amount of these delinquencies increased from ¥19.2 billion to ¥671.4 billion. The number of foreclosed houses and condos sold through auction in 2009 topped 60,000, an increase of 30 percent over 2008. The reason is simple. Many home purchasers opted for loans with variable interest rates since they started out low, but once those rates increased so did the monthly payments, and it became more difficult to pay them off, especially since wages did not increase accordingly. Home ownership thus becomes more and more difficult for younger people, whose employment options lean further toward non-regular jobs. Moreover, even renting becomes difficult, since there is no regulation of rental properties and young people cannot meet the requirements of commercial landlords. Consequently, they remain at home: 59 percent of Japanese between the ages of 20 and 24 live with their parents; 41 percent of those between 25 and 29; 25 percent between 30 and 34; and 16 percent between 35 and 39. Realistically speaking, Japan’s housing policy is the main reason for the drop in the birthrate. But the problem affects people at the end of their lives, too. Right now about 80 percent of seniors own their own homes and have finished paying for them. They can live off Japanese social security since they have no housing expenses. This situation will start to change as the society ages more quickly, since the home ownership rate drops along with age. Current national pensions are not enough to pay for rent. Meanwhile, some 7.6 million housing units throughout Japan remain vacant. Though the population is not increasing, the “housing culture” demands that more new houses and condomiminiums be built to prop up the economy. The current stock, whether for sale or rent, is not being exploited fully because rentals and sales of older homes don’t figure into the national housing policy. In particular, Hirayama believes that more units should be switched over to rentals. About 40 percent of all housing units in Japan are designated for renting, but since there is no “support” for renters in Japan, most are vacant. There is also a notable quality gap. The average size of a rental property in Japan is one-third that of a unit for sale. In all Western countries the gap is much less. And yet, the government continues to promote home ownership. Even after the so-called Lehman Shock of 2008, the government increased the tax deduction for home loan interest. Hirayama calls it “abnormal” to boost debt during a deflationary period. For reasons that may be more cultural than practical, Japan does not have any system to support renters the way it does home owners. Only 6 percent of all rentals in Japan are for public housing, either koei (low-income housing run by local governments) or kodan (run by the semi-public housing corporation UR). In Sweden, Denmark, the UK, and France, public housing accounts for 20 percent of rental units. Hirayama says the government should make an effort to provide “high quality, long-lasting rentals” through a combination of “public subsidies and support for commercial rental property construction.” He mentions the UK and France, where 20 percent of the citizens receive some sort of rent relief from the government. In Japan, only private companies provide housing, either through rent subsidies or company apartments. Of course, non-regular employees get no such benefits. The most immediate benefit of such a shift in policy would be greater independence for young people, who would be able to move out of their parents’ homes and thus marry and have children. This is exactly the reason why Denmark, Sweden, and France subsidize rents, and the policy has been a success: The birthrates in those countries have gone up as a result. Hirayama says that housing in Japan is seen as an individual economic issue, but he insists it is a social one. It is the most basic need, along with sustenance. No facet of life has a greater impact on social stability than housing, and it is the government’s responsibility to prioritize policies that make it possible for every person to have a roof over his head, and one that he likes. Fantastic article. As usual, official Japan doing everything wrong, because of what I call the ‘Japanese Razor’: if there’s a better way, ‘it’s not Japanese culture’. Great piece. Japan’s gung ho homeownership policy does sound a lot like that of the US where “housing starts” are a key indicator of economic strength and renters get bupkis. The policy prescription sounds right, but the “only in Japan” meme is a bit tiresome. For example the UK has all these problems and more, with a similar assumption (at least since Thatcher) that you’ll buy a house, and a bunch of tax incentives to make you do it. This may be of interest.